It is with light, happy, and grateful hearts that we can share that we have sold our Honda Fit! We are finally free of the stress, and free of the financial burden of owning two vehicles. What a relief! We had been trying to sell “That Puppy” (yup, that’s the Fit) for a couple of months. Neither of us expected it to take this long, but we waited and trusted that it would all work out in time – it always does. So, I don’t dart around anymore in the busy city streets in my flashy red car. I’m the lady out there driving a little slower than what’s acceptable, breaking early and accelerating slowly. You can’t be in a hurry in a Vanagon…that’s sacrilege. It’s been an adjustment for sure. For starters, there’s no coffee holders in the van. Sure, you can brew your coffee in the mini kitchen, but there was no afterthought of having a place to actually place your coffee while you drive. So in the three mornings I have taken Hobo to work, I have managed to spill coffee on the floor (just a little bit Dan…I promise to clean it up! ), and to leave not one but both of my travel mugs at work. Adjustments take time. There’s also the time it takes to warm up. So I start the engine, blast the air, and sip my coffee to the sweet sound of the squeaky engine belts. All the rattles and squeals die down within a minute or so, and I take that to mean, “it’s go time!” Off to work I go! Most startling are the mechanical warnings in our van. Those engineers meant business! I spent an entire drive home from work to the heart-stopping buzz of the low oil pressure alarm, randomly coming on. I’m just driving along, laughing at how hilarious this machine is, and BBBEEEEEEEEEEP……!” goes the alarm. Seriously, it’s like a full on fire drill…in a van…6 inches from my face. Well that’s safe! I came home to tell Dan, who told me it’s no big deal – it’s an indicator of the oil being slightly too thin, which we’ll deal with this weekend. When it IS a big deal, is when the oil light comes on and there’s no alarm – that means your oil has zero pressure. Well that makes sense…have the alarm for the “no big deal thing” and the subtle red light for the “your car’s going to blow up thing.” Perfect logic. But I love Hobo. I love the rattle of the dishes while I drive, and the fluttering curtains that nearly block my bind spot. I love the way I feel like a bus driver when I crank that wheel, and the way the van sways with every bump in the road. Most of all, I love the peace signs I get from fellow Vanagon drivers. They’re everywhere in Victoria! This is fun. This is “so us.” This feels right. 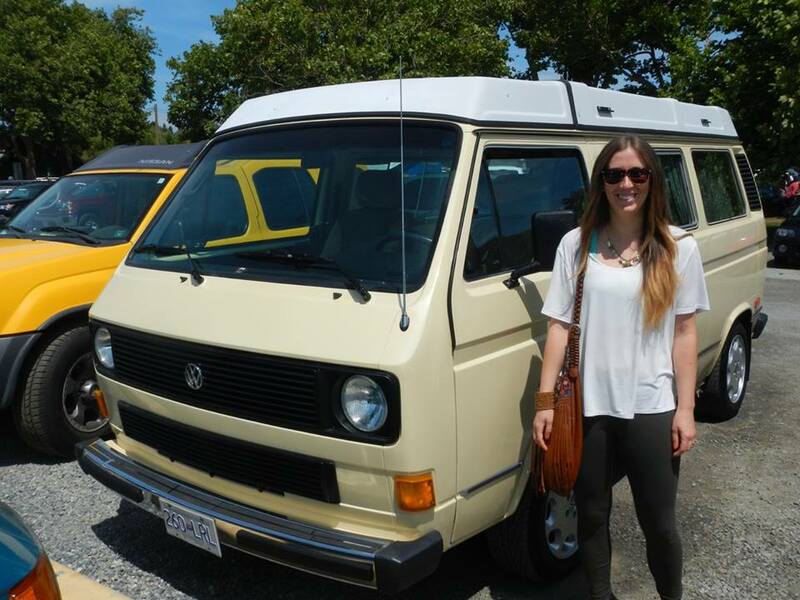 I totally agree with you about the feeling of driving a Vanagon. One of my dreams is to have my own someday so I can go van camping, one of my favourite things ever! I’ll never forget being cosy and warm in the van listening to the rain falling on the roof while camped out at Green Point campground. I’ve also had some interesting driving experiences with the VW. My favourite was the day that turning the steering wheel made the horn honk endlessly. While trying to leave a parking lot. Nothing like having everyone watching you make your exit! Thanks for sparking these memories, that was a nice trip down memory lane. And happy adventuring!